THIS LOCK CAN BE USED WHILST THE TRAILER IS HITCHED OR UNHITCHED & MAKES IT IMPOSSIBLE FOR THE THIEF TO LIFT THE HANDLE ON THE COUPLING, MAKING THE TRAILER SECURE. FOUR KEYS & CHEAPEST ON MARKET. 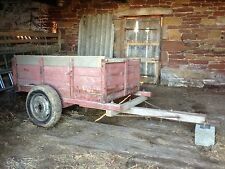 Livestock trailer, 6ft x 3ft 6” Well cared for item including tyres, cover, and brakes. Ideal smallholding. Pick up only and PayPal or cash. 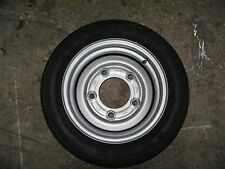 Tyre size 175 x65 x 15. TA510G MODEL. COMPLETE WITH CATTLE PARTITION GATE. LIGHT LENS IN PICTURE MISSING AS IT BROKE OFF WHEN WE WASHED IT DOWN. NEW ONE ORDERD AND WILL BE FITTED FOR COLLECTION. VERY EASY TO MAINTAIN AND USE. Plant Trailer 8ft x 4ft, all in good working order. Indespension Caged Trailer. 8x4ft. ( Cage Size) New tyres and new spare tyre None braked New Jockey Wheel. Marine ply base. Will also include the security ball. Only used for gardening waste so nothing heavy etc. Any Questions please ask. For sale is a hydraulic manual crane to go on a trailer or in the back of a pickup, has the swivel Base, and it's all complete and ready to fit, it does swivel and not a fixed crane, no electrics or hydraulics to worry about, it will lift a ton easily right in, has 3 positions on the pull out on the lifting arm. Genuine Knott-Avonride KFG35 Cast Body Auto Reverse Coupling Unit. Integral 48 mm cast jockey wheel clamp and handle, Avonride cast lockable head. Do not confuse this with cheap imitations - this is the genuine heavy duty part. 3.5 TON ELECTRIC TIPPING BRAKED TRAILER. ALL THE SIDES DROP DOWN. ALL TYRES ARE GOOD WITH 2 SPARE TYRES ALSO TO GO WITH THE SALE. ONE SIDE HAS A SMALL BEND, MAKES NO DIFFERENCE TO LOADING. ifor williams p6e Trailer . 2017. X2 New tyres (plus spare ). Great solid floor . Ladder Rack Lights in perfect working order . Jockey stand . All round very clean trailer . Very light use . 12ft x 5ft 6". Collection only. Handbrake and brakes work fine, tyres are good. Suite MP6812, Daxara 127 and Erde 122.
plant trailer 3.5 ton, new floor, led lights, good condition, galvanised. Condition is Used. Collection in person only. Ifor Williams Trailer in regular use. Collection only from PO8. Ifor Williams LT85G. Condition is Used. Any questions or viewing contact Richard on 07854016882 Advertised elsewhere so can remove item at any time. Useful 350kg utility trailer (tipping via Pedal) suitable for garden tractor’s, ATV’s and compact tractor’s, ideal for logs, leaves, grass clippings and general waste. Removable tail gate for quick and easy emptying. Here for auction we have our Bateson model 4000 general purpose trailer rated at approx 1.8 tonnes. The trailer is solid in every way and in great condition complete with tailgate ramp Its dimensions of the load area are 9' x 5' x 16" deep sides. Overall dimensions are 13'3" long x 6'6" wide. Complete with working brakes, mudguards and lights. The handbrake is present and functions but does require adjustment. Standard ball hitch and good tyres. Good jockey wheel and breakaway cable. Tyres all have good tread and hold air but do show signs of ageing. The last photo shows our 1.5 tonne mini digger loaded which it carries with ease (mini digger not part of this auction) Viewing is welcomed. No VAT. Cash on collection please. Indespension 6ft x 4ft Braked Trailer with removable mesh sides. Ramp access from rear. Condition is used but good. I have no idea of its age. I have owned it for 18 months, has a full purpose made waterproof cover that can be kept on whilst driving, even on motorway. Galvanised frame, wood floor. Was fully rewired when I purchased it and two brand new tyres were fitted, which are still in excellent condition. Comes with a tow hitch lock and a wheel clamp (2x sets of keys). 3 Ton tipping trailer, not sure how old but plenty of life left in it. Recently re-boarded now just needs a good coat of paint. For sale my Ifor Williams trailer size 8’x 4’ in good condition and ready for work. Good brakes,tyres and electrics. Loading ramp. Locking hitch. Must sell moving soon and nowhere to store. Message me for any more info. Small Indespension Plant Trailer. Condition is Used. Very good condition as has just had a thorough refit throughout which included new brake shoes, cables, brake rod, bearings/seals, wheel nuts, ram boot, lights inc LED side markers, socket and cable. Integral 48 mm cast jockey wheel clamp and handle, Avonride cast lockable head. Genuine Knott-Avonride KFG27 Cast Body Auto Reverse Coupling Unit. 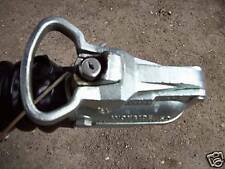 Do not confuse this with cheap imitations - this is the genuine heavy duty part. Here is my Ifor Williams plant trailer. 8x4 ft. Been a great trailer. Good LED lights, good tyres, good spare. Brakes work. The backing plates and shoes were replaced few years ago. The floor isn't perfect but still good and strong. Plant Trailer, 8x4, Indespension Challenger. Towing pins. 19mm. Linch. Hitch. Tow. Trailer. HGV. Lorry. *Top Quality! Towing pins. 1 Inch. Linch. Hitch. Tow. Trailer. HGV. Lorry. *Top Quality! Towing pins. 7/8 Inches. Linch. Hitch. Tow. Trailer. HGV. Lorry. *Top Quality! Towing pins. 22mm. Linch. Hitch. Tow. Trailer. HGV. Lorry. *Top Quality! Trailers are often used for heavy-duty farming and agriculture work, so opting for a high-quality model will ensure a practical and durable option for a variety of uses. There is a huge selection of agricultural farming trailers in different sizes and models plus lots of handy accessories and parts to ensure the trailer is well-maintained and fit for use for years to come. Farming and agricultural activities often require hard wearing and durable equipment that can withstand a range of weather conditions. There is a large variety of trailers in a range of sizes dependant on the requirements of the user. For smaller loads and light agricultural work, smaller trailers are ideal for transporting equipment and feed. Larger sizes can be useful if you are moving animals or heavier equipment plus there is a selection of flatbed trailers perfect for moving vehicles. Agricultural trailers offer a heavy duty way to transport horses and cars with ease. The variety of horse trailers or boxes provides a safe and secure environment for transportation. Other features including ramps and increased space with wider stalls which provide horse and owner with a space to load and unload the animal. If you're looking to transport farm equipment or vehicles, there is a range of flatbed trailers suitable for a range of vehicle sizes and weights. Vehicle trailers often come with handy extras such as wheel jockeys, headboards and removable drop sides so loading and unloading are easier. There are many parts and accessories to choose from when maintaining a trailer or adapting it for specific uses. Useful extras include mesh skids, mesh ramps and winches for easy loading and uploading. Other features include replacement trailer floors, partitions, hitch locks and equipment such as crane extensions.